I was just looking for examples on how to explain light and shadow for my beginner's class this weekend when I happened upon this blog. It is an excellent resource! It covers a lot of the different areas of understanding light and shadow that I had to go over in my drawing classes in art school. If you are someone who struggles with highlight and shadow placement, read through this and follow along with the couple of quick exercises. It is well worth the read. I had a fantastic time at Crystal Dragon this year. It was my first time and I will definitely be back. It was also an absolute thrill to receive a best in show award for the Sorayama Marilyn bust. Fans of Hajime Sorayama will recognise instantly where the idea came from. 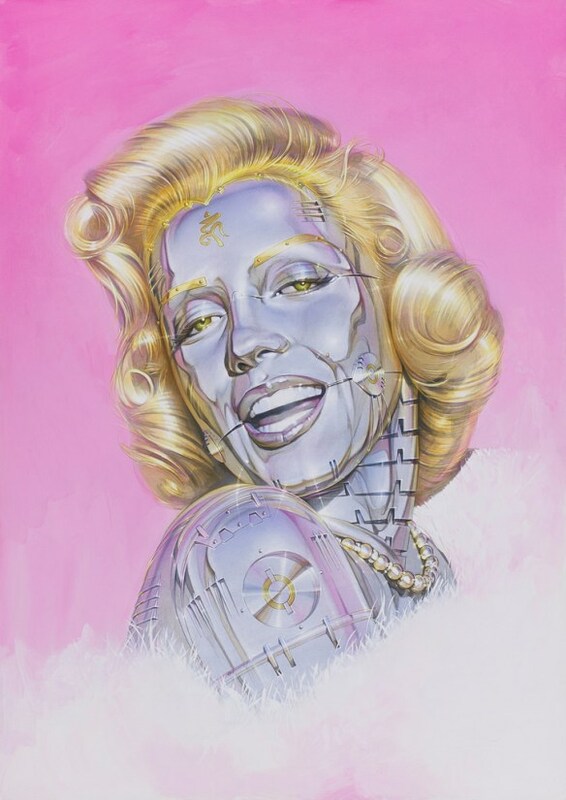 I wanted as much as possible to emulate the hyper-realism style of Sorayama's robot pinups, which included several paintings of Marilyn. 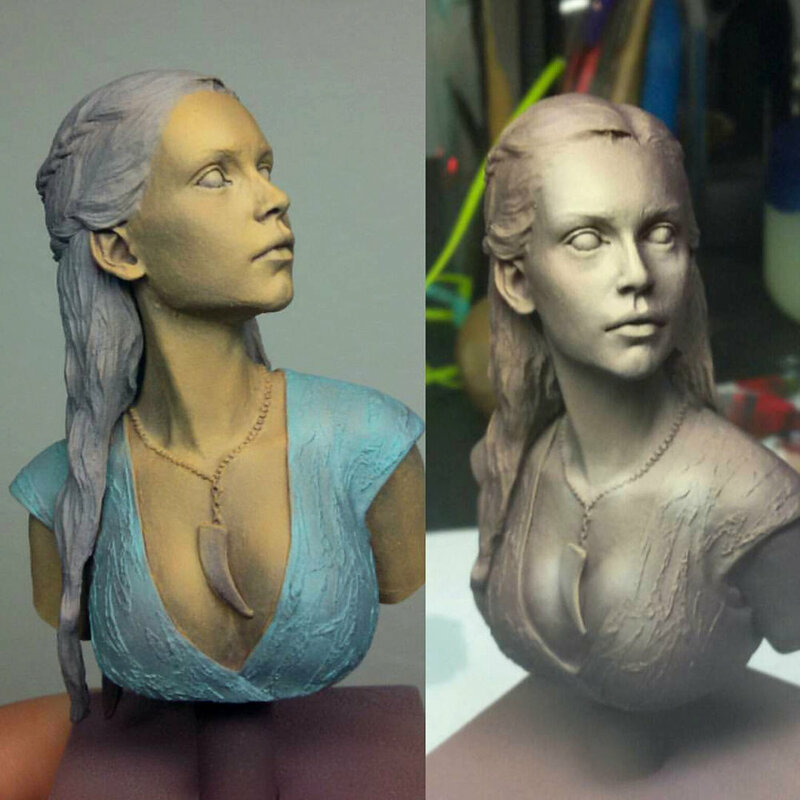 The original Marilyn Monroe bust is from Life Miniatures and it is a gorgeous kit. 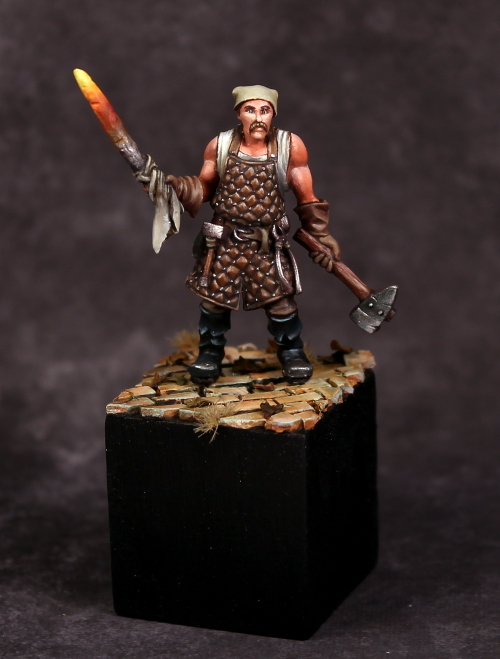 The sculpt and the quality of casting made it a joy to paint. Before I started the project, I spent weeks looking at Sorayama's work trying to understand how it could translate to a model. Immersion is an important part of my process. Sorayama employs 2D illustration techniques to communicate the way light behaves in a 3D environment. For me, the most impressive aspect is the way Sorayama negotiates plane changes and the reflective behaviour of different materials, from metal to fabric to translucent skin. I really had to think about how to use a 2D painting technique on a 3D model to look like a 2D painting that was depicting light on a 3D form—quite a meta-dilemma! In terms of execution, I kept to a few landmarks in Sorayama's approach: sharp lines to seperate volumes combined with the impression of edge highlighting to emphasise a surface change; soft colour transitions; heavy use of reflected colour; characteristic light flares particularly on metal surfaces. The piece was painted by brush over plain white primer. A lot of time was spent on the linework that would transform Marilyn into her robot version. The majority of colour work was done with glazing and fine directional linework. Finally, the "Skynet" logo on the jacket was a cheeky tip-of-the-hat to pop culture (Trent Denison and I came up with the idea to do this on both our busts—see his K0-HANA). Overall, there was about 30hrs painting on Marilyn, which is relatively quick for me! A huge thanks to Meg Maples and Mark Soley for running and judging the Crystal Dragon painting competition. Thanks also to the judges: Sebastian Archer, Roman (Groobsy) Gruba, and Kara Nash. It has been amazing to meet and swing a brush with so many fine painters. I can't wait to see everyone again next year! 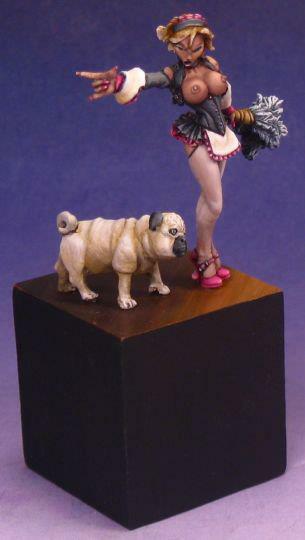 Part of the Judge's Choice Award that Macca won for his Sorayama Marilyn is that he will be participating as a Guest Judge at Crystal Dragon 2019. We look forward to welcoming him as part of our judging team as well as seeing what other fantastic creations he cooks up in the next year. Congratulations again, Macca, on your win this year! May your paint stay wet and fire burn bright! A new company popped up on the scene recently, Redgrass Games, based in France. They started developing a new wet palette. One they were promising to be a more high tech version than many of the homemade wet palettes used by painters around the world. At first, they were trying to create a sponge that you could put your paints directly on for use and then clean off at the end of your painting session. I imagine it felt a lot like an ink pad and it sounded like a really cool idea! I would be all for it if it means I can ditch using paper. Especially for travel! It would be one less thing to pack. And these days, when I try new products, I scrutinize them and how easy they would be to travel with and whether or not I would recommend the product to my students. Unfortunately, the special sponge they were trying to develop hasn't worked out but they still wanted to launch a Kickstarter for a palette. So they scrapped their original idea and used chamois and paper instead; much like a traditional homemade wet palette. When they asked if I would review it, I was more than happy to. 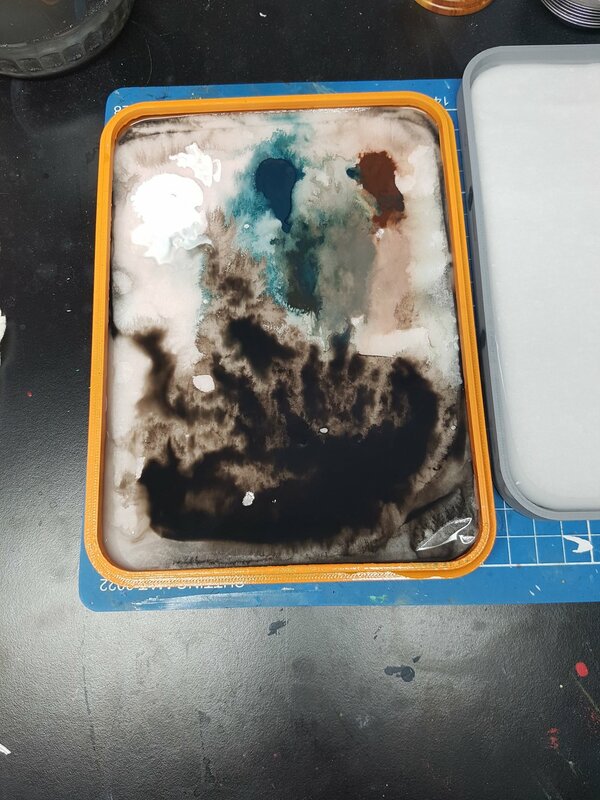 I was excited at the idea of a new wet palette that would be marketed towards miniature painters and likely made available in game stores. 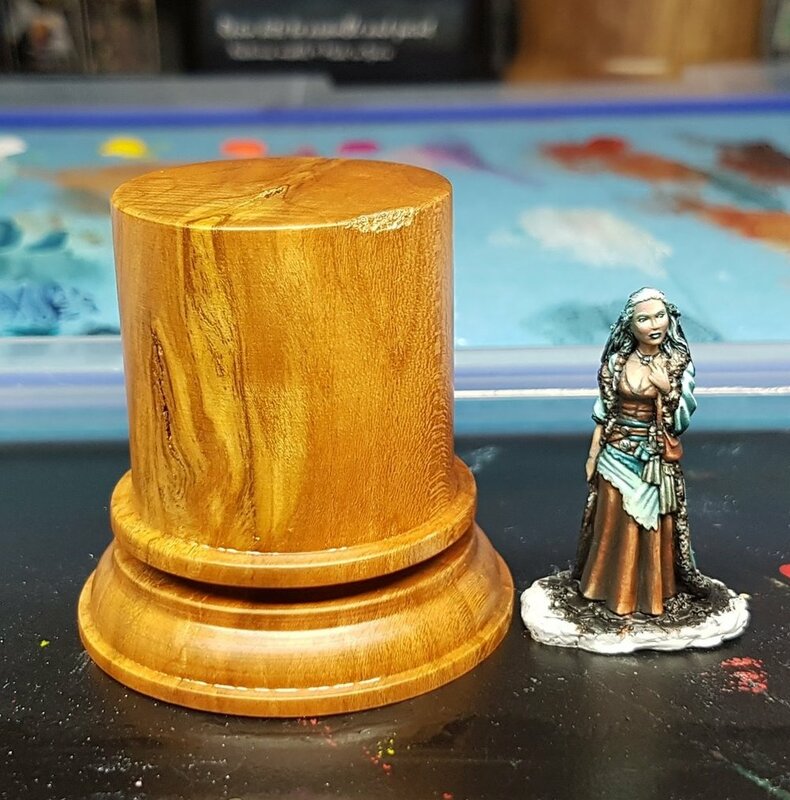 As a teacher who has a lot of new or beginner level students in classes, the most common scenario is that people are exposed to miniature painting through their game store. They get what the shops recommend which is usually GW paint, Army Painter brushes and primer and a whole slew of other low quality products. However, most game stores don't carry palettes of any type and it is sort of taken for granted by those more experienced about what should be used or where to find things. And if the game store does carry a palette, it is gonna be the hunk of junk that is the P3 palette. In Australia, the P3 palette is sold for upwards of AUD$50 fo something smaller than a VHS container that uses packing foam and tissue paper. Additionally, in Australia, Masterson's only just picked up distribution in the country at the last half of 2017 through National Art Materials. That means Aussies have either had to buy the Masterson's from the US or Europe, buy the P3 palette and be frustrated by it, or create a homemade one using kitchen sponge sheet and a food storage container. The idea of a new wet palette, that is a quality product, being carried in game stores at this far flung part of the painting world got me excited! Finally, I would be able to give my students a shopping list for class and they could support their Local Game Store at the same time! With all of this optimism, I cracked open the palette! The one I was sent is just a 3D print prototype. The finished product will be a bit different including an airtight seal (which means it is meant to be water tight as well). It is around the size of an A5 sheet of paper (5.8inch x 8.3inch - or - 148mm x 210mm). The sponge supplied was a white chamois type material. Chamois is a lightweight, synthetic material that is super absorbent (holds a lot of water) and is meant to be mold resistent. I used to use a chamois towel when I was a competitve swimmer and the things lasted forever! The paper felt like a cross between tissue paper and baking paper. It was thinner than baking paper and not as slick. This is the part that interested me as this is the part that is different to homemade palettes. Let the experiment begin! This test took place in Goulburn, NSW from Friday September 15th to Sunday September 17th, 2017. Time of year is early spring with evening temps below 0C and day time temps between 13C and 18C; It is still cold here. Environmental factors affect the way prodcuts such as wet palettes and paint behave. Medium Body and Heavy Body Acrylics were used, not Fluid Body Acrylics (most game range paints are Fluid). No instructions were provided on how to use it so I treated it the same way I would my homemade palette. I put water in the tray and let the chamois soak up the water. I kept the water line at the line of the chamois as well. Then I placed the paper in it. It started to curl, which is normal when using baking paper, so I flipped it over to wet the other side. The logic here is that if one side gets wet then only one side relaxes in the water which causes the curling. Wetting both sides means the paper will fully relax and lay flat. Then I added 3 dollops of Heavy Body Artist Acrylic. Something to note: Heavy Body Acrylics take a lot more water to become dilute or runny than Game Manufacturer paints which are Fluid Body Acrylics. As soon as I put the dollops of paint on, the color started to run. This is not good . . . Fairly certain something went wrong, I still continued to try to mix colors. I was okay with getting a less than perfect result because if it is this easy for me to misuse the palette, how is a newbie going to fare? I wasn't too worried and I sent photos to Redgrass to get some info from them on where I went wrong. Sure enough, the mess above, was due to User Error. They advised to not wet both sides of the paper and that it would likely curl just at the edges but to flatten it with my fingers. 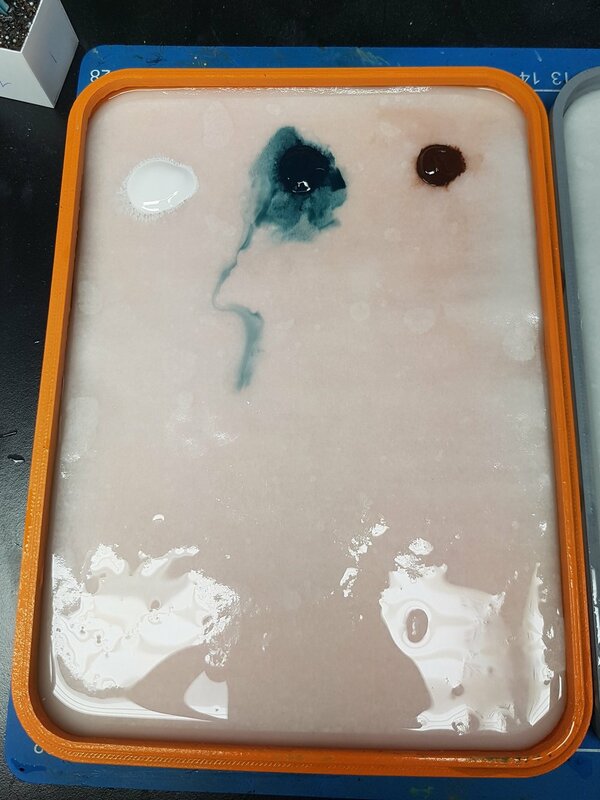 Apparently, there was too much water in the palette. Awesome sauce! I ditched this paper, rinsed the chamois and then tipped out all excess water then layed new paper on the sponge then repeated the experiment. Using my Medium Body Acrylics (Jo Sonja) and my Heavy Body Acrylics (Schminke), I put new dollops of paint on the palette. I then mixed up a skintone. This way, I could see how a mix fares on the paper as well as just the pure dollops of paint straight of the tube. I used some of the color for a couple of hours but noticed a lot of water was coming through the paper still and it was affecting the consistency of my paint. This made me a little apprehensive. If over the course of a couple hours I was already having this issue, how was the paint going to hold up overnight or even several days later? Knowing I wasn't going to paint this weekend, it was an optimal time to see how this thing works passively. I closed up the palette on Friday night at 11pm. I then opened it up on Saturday morning at 11am. So it had 12 hours to sit closed up. Why is this important? Well, when using a wet palette, you should close it up between sessions to keep the evaporative process in the container. By containing this process, the water trying to escape through evaporation ends up recondensing in the wet palette which is what keeps paint hydrated when using baking paper. Baking paper doesn't actually let moisture through the paper. It keeps moisture around the paint. With the paper supplied with the Everlasting Wet Palette letting moisture through plus also containing the evaporative process by closing the container, too much water is introduced into the paint. This is a particular problem for painters like myself or my husband, who use the same paper and paint for days at a time. Mark even uses the same baking paper sheet and paint for a month or more in his homemade palette - no problem. I then left the palette open the rest of the day Saturday and checked it again at 9pm on Sunday. Even left open, more moisture was let through the paper and into the paint. Not the worst result. In fact, this could possibly be a good thing in the summer time. Then I removed the paper from the sponge and saw another problem - the yellow had seeped through the paper and into the chamois. Which means that you cannot leave your paint in this palette for days or weeks at a time as it will end up coloring the chamois underneath. Yellow seeped through on the sponge after 70 hours in the palette. The conclusion of this 3 day experiment is there are pros and cons to this palette. I like the slim profile of the container for travel. The chamois is a nice alternative to sponge and is mold resistent. They will be providing a grey sponge in their kit which means you have a neutral palette color to mix your colors. This will allow you more accuracy when mixing. 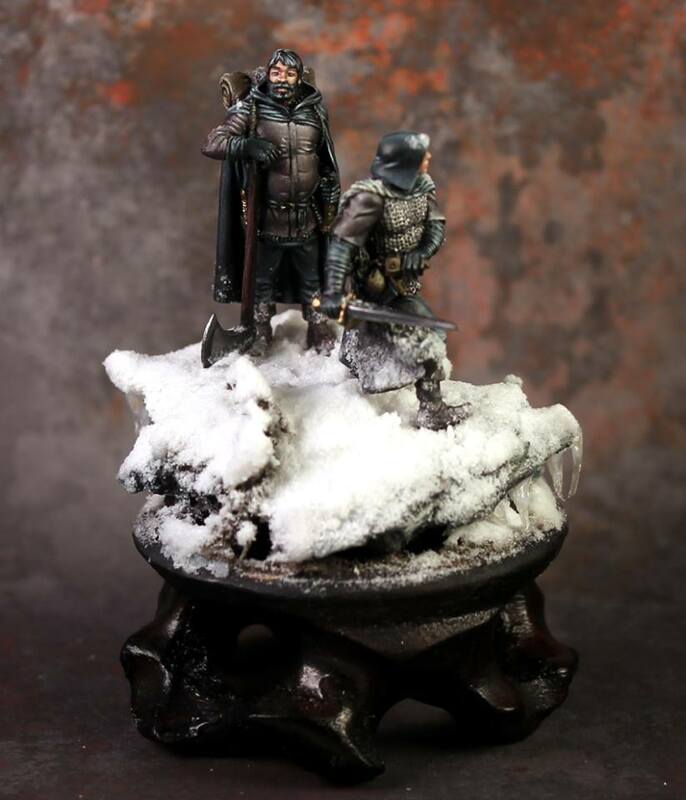 It is marketed for miniature painters and it is much better quality than the P3 palette which is the only other one usually carried in game stores. New Painters may be exposed to this earlier if they are carried at Local Game Stores. The paper is too unforgiving. It allows too much water through which in turn means it will let paint through to the chamois after a few days. It doesn't seem to be designed for more than one session at a time as closing it up will dilute the paints further. The A5 size is just too small to work with regularly. I let Redgrass know of the technical difficulties I experienced on my end. They have claimed I am the only painter to report any issues with the product as well as stating that I didn't use their product with the correct paints by using my Heavy Body Artist Acrylics. That said, I am not sure of the process the other painters have used who have tested this product so I cannot comment on their results. I can only comment on mine. I asked them what time of year the other painters reviewed their product but they didn't respond. They just said the other testers were in the Northern Hemisphere. Why did I ask this? The way wet palettes work in the summer time, when it is hard to keep indoor temperatures cool for painting, will differ from the way they behave in the winter time. If everyone else who has tested it is in the Northern Hemisphere and has tested it within the last 3 months it has been summer time. For me, I am currently at the tail end of winter/beginning of spring. Our temps at night are still dropping below 0C (below 32F) and have been between 12C (54F) and 18C (65F) in the day time. In other words, it is cold outside which means inside the studio is cold and we have to kick the heater on to get to 18C inside the house. Therefore, extra moisture coming through the paper and into my paint isn't a good thing right now. However, it may be better in the summer time when that extra moisture is needed. Personally, I do not feel this is an improvement on what people can make at home. Had there been a massive improvement in design and function, I may feel differently. However, they have taken a classic design and packaged it all up for 25Euro for their base pledge on their Kickstarter. 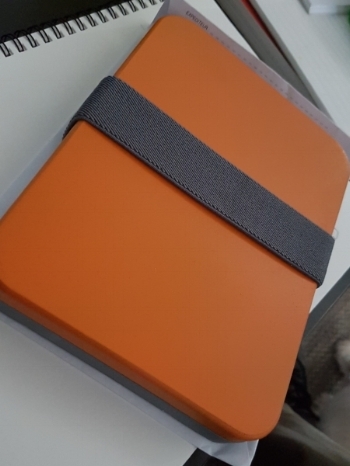 The pledge level includes the A5 palette, 2 chamois cut to size and 100 sheets of paper cut to size. Is it convenient to purchase all together? Sure. Is it cost effective? No so much. All of this said, if Redgrass games were to develop their original idea with a sponge you can put your paint directly on for use and then clean off, I would definitely be up for trying that to see how it works. That was the real innovation many seemed to be interested in when they originally announced their project. It is a shame it hasn't come to fruition. I hope they do continue to pursue the original idea. For now, 9 out of 10 painters approve this product. I am just that one awkward result that isn't totally sold. Now that I have been teaching for about 5 years, I would say the No. 1 topic painters struggle to get a handle on to move forward with their painting is contrast. For many it feels unnatural to create such dark shadows and such bright highlights because it isn't how we see surfaces and lighting around us on a daily basis. What is often glossed over in teaching and discussing contrast, is that with miniature painting we have to create an optical illusion with our painting. I know it sounds weird but hear me out. 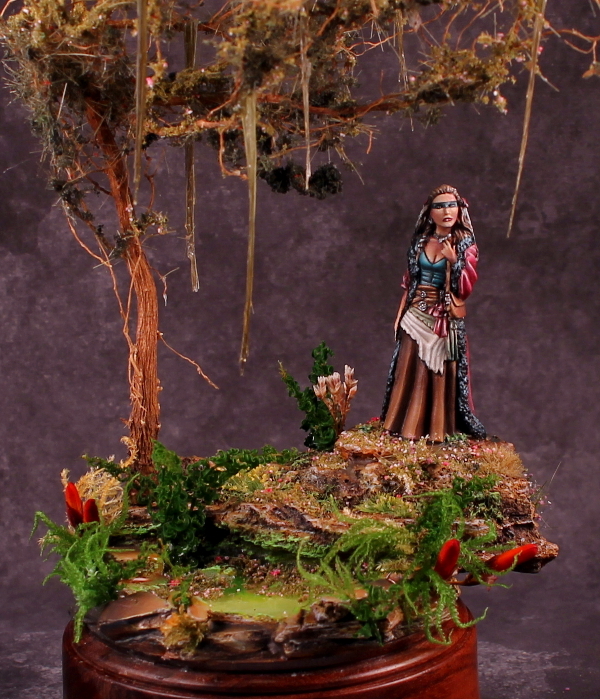 Miniatures are scaled down representations of creatures or objects we have some real world analog for. Yes, I know, there are no real mermaids but we have fish in real life and humans in real life. 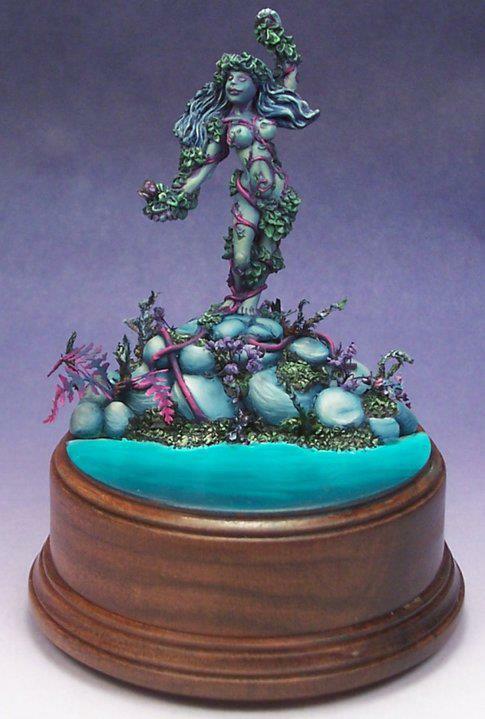 Therefore, a mermaid has real world analogs that we can use as reference for painting. Same goes for all fantasy creatures. In someway, everything resembles something we know or can identify with. Since these representations are scaled down, our lighting and colors also need to scale in order for our brains to be able to read the piece correctly. 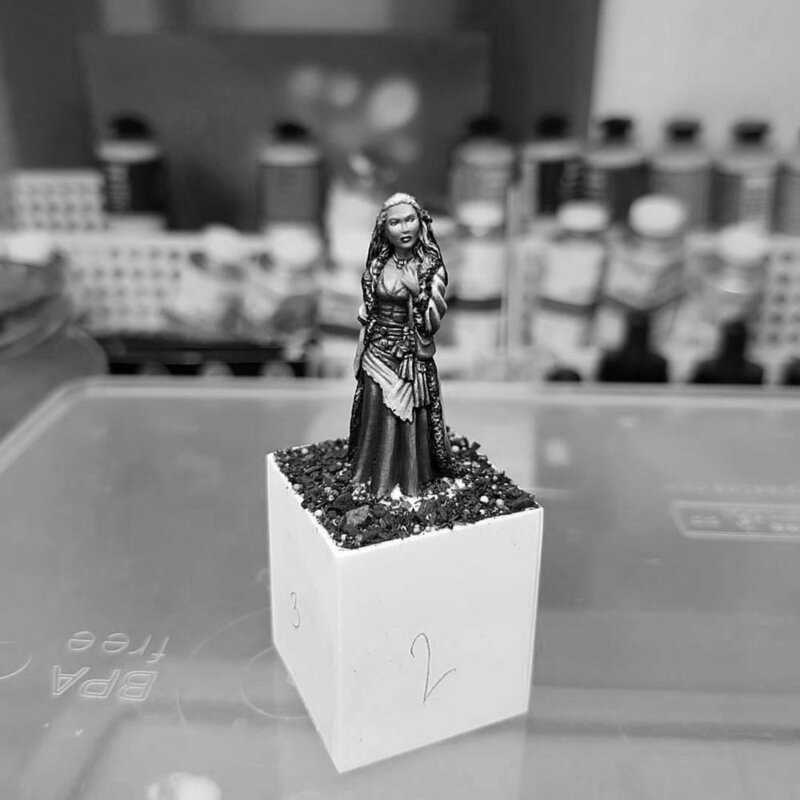 Try looking at an unprimed model from a distance and you will see that without paint or any sort of contrast on the model, it becomes difficult to discern exactly what you are looking at. This is the case for models that aren't painted with the appropriate level of contrast. They come off looking "flat". In this instance, flat means that there isn't a lot of difference in value between shades, tones and tints. This is where contrast comes in. We need to make sure that not only our highlights and shadows contrast on each surface, but that when picking our color scheme, the base colors of the surface of the model contrast with each other. That means we can't paint an entire piece in just middle values. We need to have light colors, dark colors and middle value colors. So, how do we check that we have contrast between the surfaces of our model before shading and highlighting? By using a camera trick! If you have a smart phone you can take a photo of your work. Go into the Edit mode on your phone and find your Saturation Setting. Click it and completely desaturate your photo. By doing this we remove the hue and only observe the value (relative lightness or darkness). In the photos above, we can see how this trick is used. The first photo shows a side by side of the model with just thin basecoats on and the airbrush primer job. The second photo is the first photo completely desaturated on my Samsung Phone. The third photo is the final paint job and the last photo is a desaturated version of the final paint job. In the second photo we can see that all of my basecoats are about the same value. 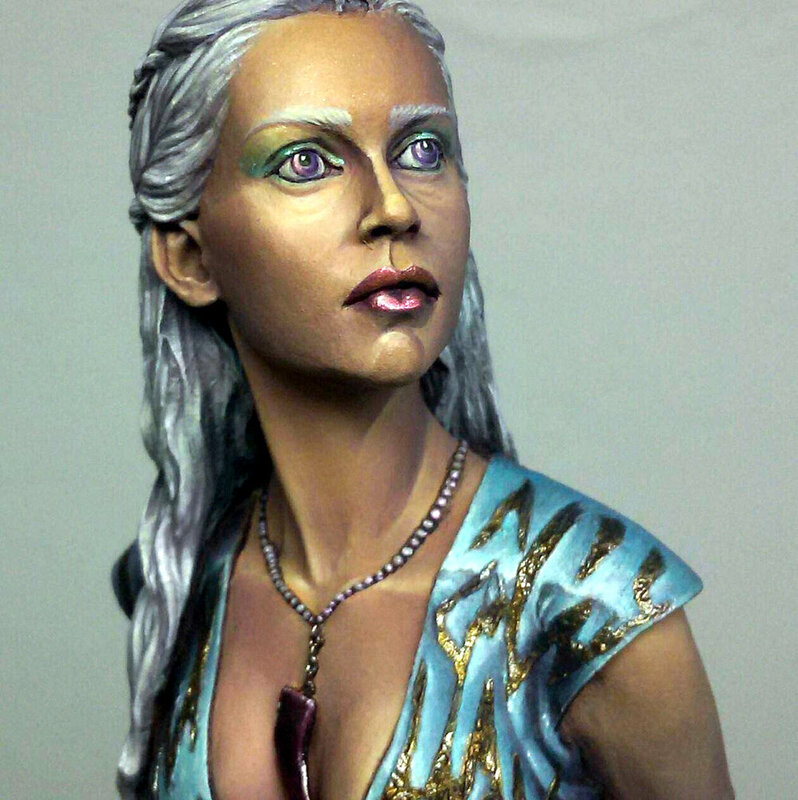 Once the color is removed from the photo, Danerys looks completely grey. There is no difference in the value of the colors used in the basecoat. 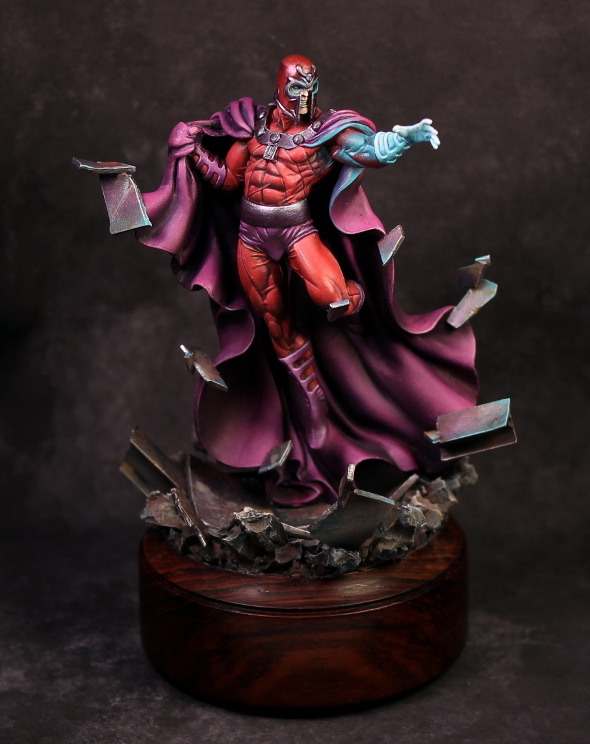 You can also see that just looking at the thumbnail of the image it is really hard to see details of the sculpt. 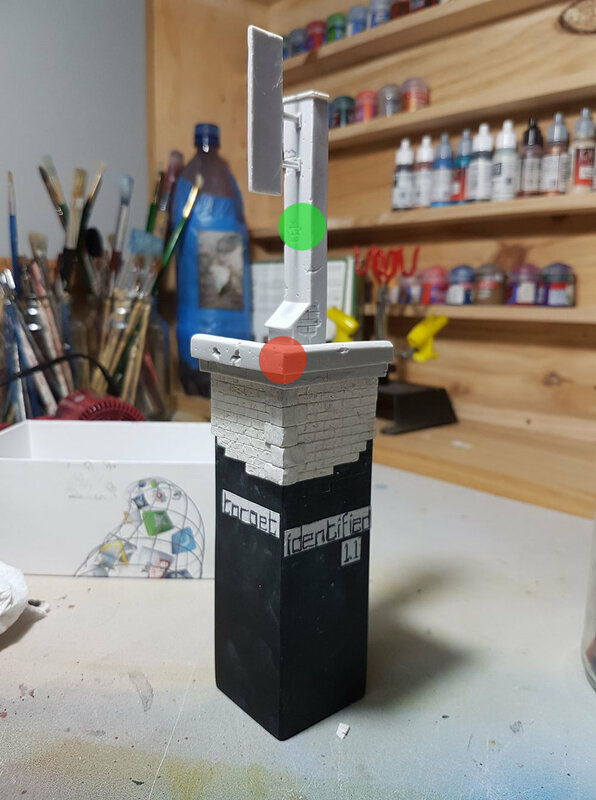 This allowed me to see how I needed to proceed with the paint job to create more contrast between surfaces and within each surface. 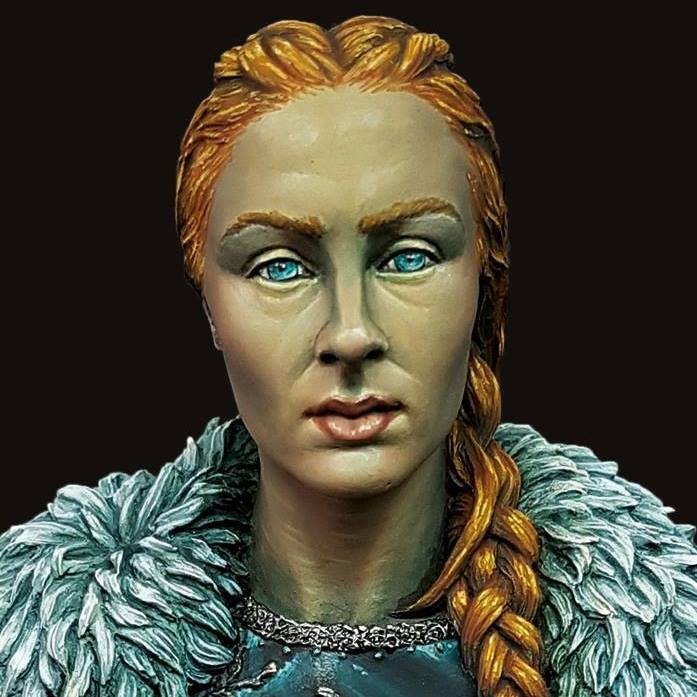 With the final paint job and increasing the contrast, we an finally see all of the details of the sculpt and accentuate certain aspects of it to make it stand out. There is a reason why I have specified how to desaturate your photo. You don't want to use a Filter on your phone. Nearly every phone has a Grayscale Filter but it alters the photo as opposed to only removing the color so you can accurately see the value of the color. Make sure you are following the correct procedure when trying this trick. 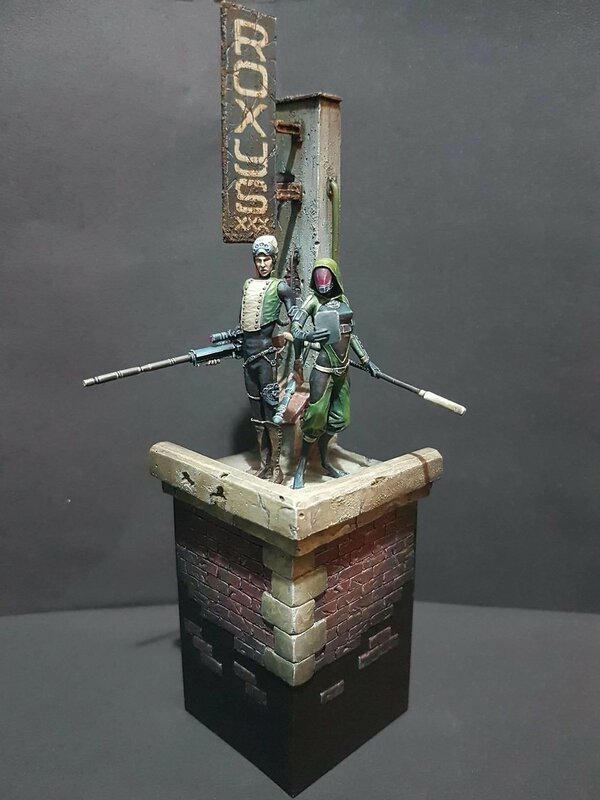 Here are some more images of models with a good level of contrast to them.